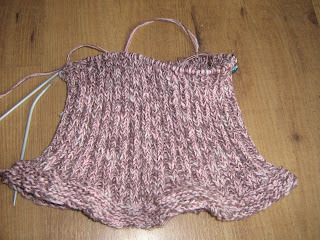 More friends and a blog: Fitted knits Back-to-School U neck vest. Fitted knits Back-to-School U neck vest. Now, what does a mother of two boys who have never been to school call her vest, it can't really be called a back-to-school vest, can it? 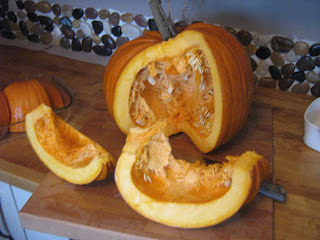 We also did a bit of work (finally) on our kitchen back splash which you can see behind this pumpkin. Yes, we are still cooking pumpkin to freeze, the pumpkin muffins went down a treat so we are stocking our freezer with cooked pumpkin so that we can make them often. Love this vest pattern, Heather! It will look great in the yarn you thrifted. Hmmm... guess we need to go thrifting for some more yarn? Afterall, you still want to knit that blanket. I can see you in that, it'll suit you! Hope to see you tomorrow, seems like it's been ages since we all got together.